Get Close to Opera develops a project design method based on the Multiple Intelligences Theory by Howard Gardner (MIT) applied to Opera, in order to promote the linguistic and cultural integration of migrants and refugees in Europe. We intend to start to create a community of people that rethink Opera Houses as spaces of social innovation, inclusion, cultural exchanges and learning. For everyone. Finally, we will share our experiences and our educational tools on an online platform dedicated to all those who, in turn, would like to experiment and further develop the GET CLOSE TO OPERA method. Get Close to Opera is a project co-funded by the Erasmus+ program of the European Union. 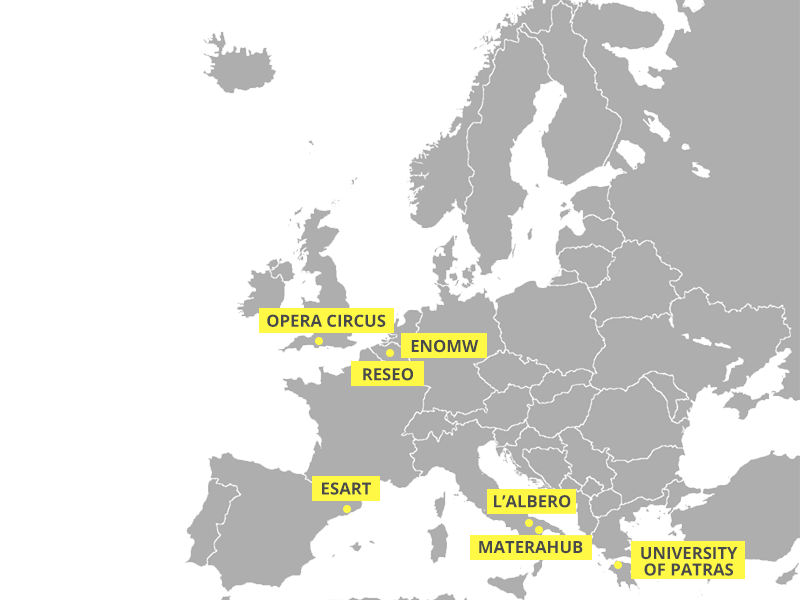 The project is led by Materahub consortium, the theater company L’Albero (both in Italy), the RESEO network, the European Network of Migrant Women (both based in Belgium), the Opera Circus company (based in UK), the ESART campus (in Spain) and the University of Patras (in Greece).